Let dinner tonight be a Cajun occasion! 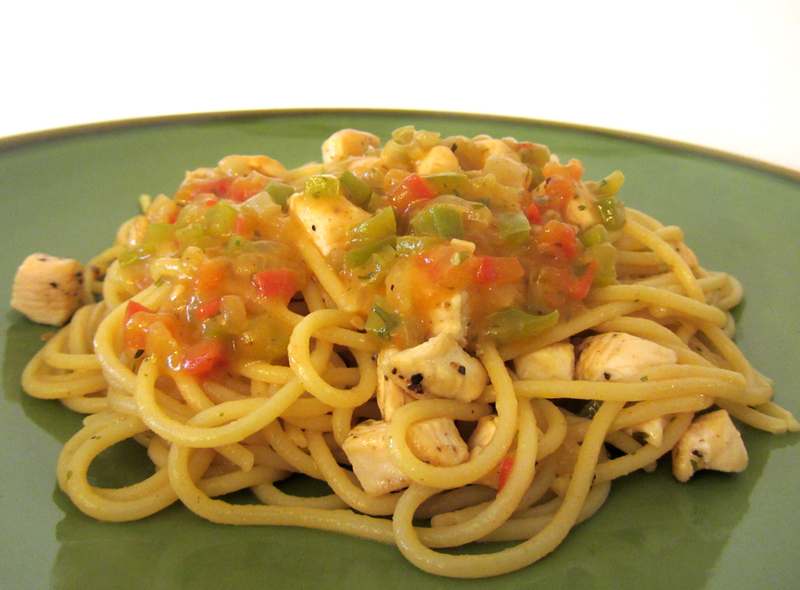 This dish is kind of like a chicken etouffee over pasta. As is, the recipe is mild, but you can turn up the heat as you please. You could also swap out the chicken for seafood. This recipe is adapted from Top Secret Restaurant Recipes by Todd Wilbur. It is easy to make and to customize and, most importantly, it's tasty; a nice way to serve some classic flavors in a new way! 1. For the Roux: melt the butter in a small skillet set over medium heat. When the foam has subsided, whisk in the flour. Reduce the heat to medium-low. 2. Cook, whisking often, until the mixture is dark tan like peanut butter. Remove the pan from the heat. 3. Immediately whisk in 1 1/2 cups of the chicken stock until smooth. Set aside. * If you are making the sauce in advance, do not cook the chicken yet. Make the rest of the sauce as directed, transfer it to a bowl and let it come to room temperature, then cover (place a sheet of plastic wrap directly onto the surface and another to cover the bowl), and chill until ready to use. When you're ready to use the sauce, prepare the chicken as directed and then use the same skillet to reheat the sauce. If you will be using the sauce right away, this is a good time to start the pasta water boiling. 4. Heat the oil in a large skillet set over high heat. Once hot, add the chicken pieces. Season with salt and pepper. Saute the chicken until cooked through. Transfer the chicken to a plate. 5. For the Sauce: in a small bowl, stir together the salt, white pepper, paprika, thyme, and chile powder. Set aside. 6. Melt the butter over medium-high heat in the skillet used to cook the chicken. Once hot, add the peppers, onions, celery, and garlic. Saute until the vegetables have mostly softened. 7. Add the wine and tomatoes to the pan and cook for one minute longer. Stir in the spice blend. Stir in the roux mixture along with the remaining 1 cup of chicken stock. Stir in the parsley. Bring the mixture to a simmer. If the sauce is thicker than you would like, you can thin it later with a bit of the pasta water. Turn the heat off, but leave the pan on the burner to keep warm. 8. Prepare the pasta according to package instructions (be sure to add 1 tbsp of salt to the water). Drain. 9. Reheat the sauce if necessary. Stir half of the chicken into the sauce. Toss the pasta with half of the sauce. 10. To serve: place the pasta in a large serving bowl OR preportion it onto plates. Top the pasta with the reserved chicken. Top that with the reserved sauce. Serve!